Read Our Minds… Macmillan Publishing’s authors share their perspective on the world at large through original essays, revealing interviews, and insightful book excerpts. I love the drama of elections. I love the constant polls and predictions, measuring the desperate efforts to slide ahead by even a few points. Then there's the thrill of tracing the cause and effect between every well-documented micro-event and the tiny ticks up and down in the numbers. Even the way we create those numbers affects those numbers. The importance of data and a surfeit of information doesn't mean we know everything. On the contrary, there is always intrigue, because there are always secrets, and there are always scandals, because some of the secrets are going to come out. The stakes couldn't be higher: the winner gets some portion of ruling the world. Because of that, and because the people who are willing to undergo these gauntlets are people who love winning, armies of intelligent underlings are deployed, polls and focus groups are read like omens, and overblown amounts of money are squandered on logistics, wardrobes, and catering. It's a horrendously expensive, relatively violence-free version of epic warfare, complete with heroes, villains, and derring-do. 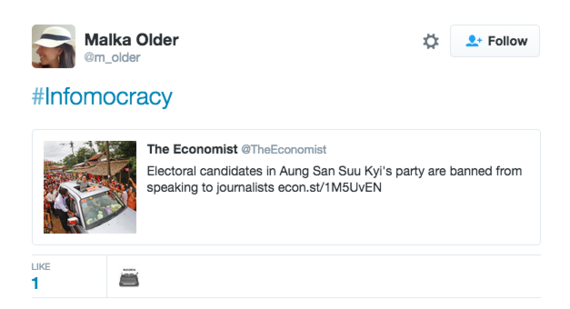 And the tellers of our elections are multifarious and muddled. The lying is, to an extent, understood as part of the game. But lately I've found that the different storylines tend to sail past each other, without even meeting for fisticuffs in the middle. Sparring with someone on the opposite side of the contest used to be cherished fun; now I rarely bother. 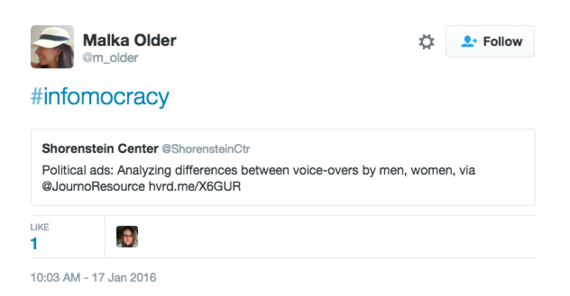 Since the two of us are likely to be working with entirely different sets of information, what's the point? I hesitate to quote even those pundits I agree with, because I'm not sure I trust their numbers or their facts. It's a shame, too, in something of the same way that the ubiquity of guns makes action movies less exciting: instead of fight sequences or creative weapons, we get bangs, flashes, and unrealistically agile heroes paired with unrealistically inaccurate shooters. If only we had the information management capacity to know what's going on. 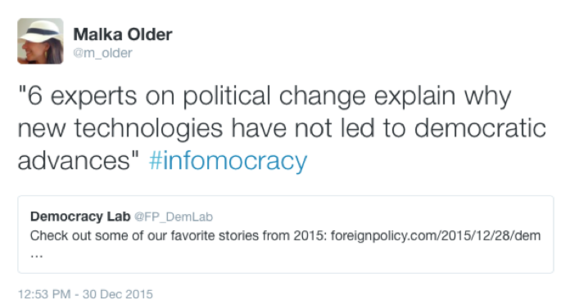 We're already living in an infomocracy, whether or not we know it. 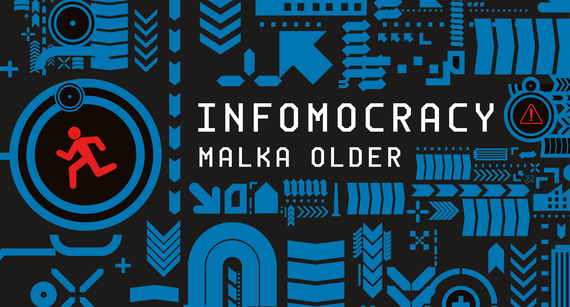 Malka Older is Senior Fellow for Technology and Risk at the Carnegie Council for Ethics in International Affairs, and she's brought her extensive background and knowledge to INFOMOCRACY, her science fiction political thriller out in June. 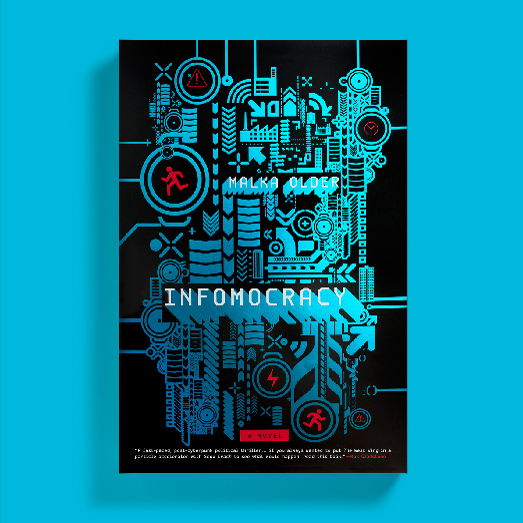 She's written a post about the way she's connecting real-life news to the world of the book using the hashtag #infomocracy, and lays out her argument for why we're already living in an infomocracy: a world where data, perception, and elections are all intimately connected and susceptible to manipulation on a level never seen before. Read more at Thought Matters. Sign up for originals essays, interviews, and excerpts from some of the most influential minds of our age.